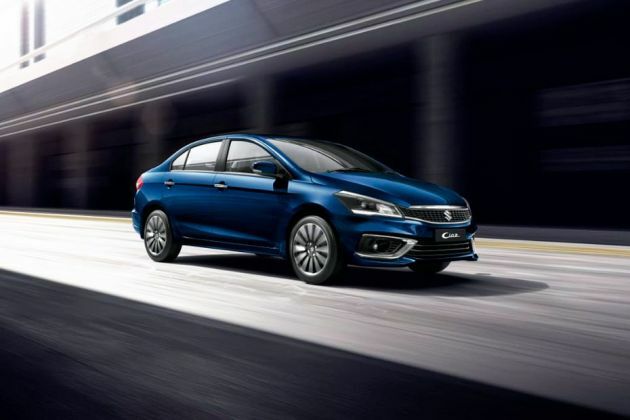 Launched in the October of 2014, the Maruti Suzuki Ciaz has been yet another successful car from the Japanese carmaker. Offered in both petrol and diesel engine options, the Ciaz is available in eight variants; four with either engine option â?? Sigma, Delta, Zeta and Alpha. There are two automatic variants also on offer in the Ciaz - the Zeta AT and the Alpha AT. The Maruti Ciaz 1.4 AT Alpha is the range-topping model and is Rs 1.16 lakh dearer than its manual Alpha version (as of May 9, 2017). Powering the Ciaz automatic is a 1373cc DOHC petrol motor, which pumps out 92.5PS of max power and 130Nm of peak torque. It deploys a four-speed automatic transmission. The claimed mileage of the automatic version is 19.12kmpl. On the outside, the Maruti sedan gets projector headlamps, 16-inch alloy wheels, glass antenna and body coloured ORVM with turn indicators. For the added premium-ness, it gets chrome garnishing on the front grille, trunk lid and door handles. Based on the top-end Alpha trim, the interior is plush and fully loaded with features. It gets leather seat upholstery, leather-wrapped steering, chrome garnish (steering wheel, inside door handles, AC louvers knob parking brake lever), wooden finish on I/P garnish, chrome finish on floor console and MID (trip meter, fuel consumption & outside temperature display). With respect to comfort and convenience, the Ciaz is bestowed with the push start/stop key, keyless entry, power windows with driver side anti-pinch, rear AC vents, automatic AC, height-adjustable driver seat, rear sunshade, electrically adjustable and foldable ORVMs, accessory socket (front & rear), tilt steering, touchscreen SmartPlay System with Bluetooth, navigation, voice command and USB connectivity, audio with CD player, steering mounted audio and phone controls and many more. As far as rivals are concerned, the Maruti Ciaz automatic competes with the likes of the Hyundai Verna AT and the Honda City CVT.